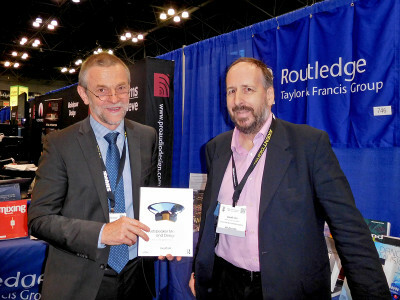 Since its publication in 2010, “Current-Driving of Loudspeakers" by Esa Meriläinen, was received with both enthusiasm and skepticism. Effectively, Meriläinen anticipated the criticism when writing in his book preface: “The subtitle of the book may at first sound too much promising or inflated, which it, however, is not at all; for as will show up especially in chapter 4, the issue is indeed about a fundamental fallacy in sound reproduction technology.” In this article, published originally in Voice Coil, July 2010, Joseph DeMarinis not only reviews the book but also runs tests of the theory. 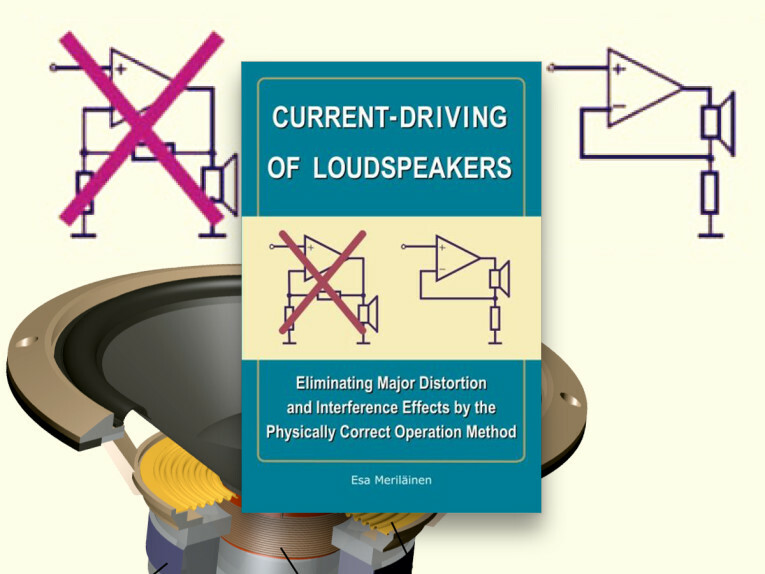 In his book "Current-Driving of Loudspeakers", subtitled “Eliminating Major Distortion and Interference Effects by the Physically Correct Operation Method,” author Esa Meriläinen challenges the conventional wisdom of driving loudspeakers from amplifiers that are voltage sources. He is clearly a very skilled and knowledgeable (Master’s degree) electrical engineer, resides in Finland, and has written this book as the result of a long-term hobby interest in the subject. Little else is known about him. His 342-page treatise is very thorough and touches on just about every aspect of sound reproduction. It is an excellent tutorial, leaving no stone unturned. Because it is well known that the current passing through a loudspeaker voice coil is what causes it to move, the idea of tightly controlling that current (rather than the voltage across the coil) is a very seductive topic. Current drive amplifiers have been possible since the invention of negative feedback in 1927. I am sure that over the intervening 83 years many audio equipment designers, in quest of a competitive advantage, have experimented with the subject. Yet, the practice has never been adopted by the industry. The author is well aware of that and has poured his heart and soul and his engineering skill into trying to convince us all that we have gone down the wrong path. This is not light reading! The book is very heavy with math and is an excellent refresher course in the mathematics of circuit and electromechanical system behavior. Whether you agree or disagree with his conclusions, the book is so detailed and thorough that it deserves serious consideration. However, the bottom line is whether current drive truly results in improvements, and I was compelled to find out. I modified one channel of an old stereo receiver to be a current source and ran a bunch of lab measurements and listening tests on a few available speakers. It was a much more complex effort than I’d anticipated. More about that later. An ideal voltage source delivers a voltage that is held constant regardless of the load. In an ideal case, its source impedance is zero (looks like a short circuit). An ideal current source delivers a current that is held constant regardless of the load. In an ideal case, its source impedance is infinite (looks like an open circuit). Bear in mind, however, that real voltage and current sources don’t achieve those ideals. According to conventional wisdom, there are two very good reasons why voltage drive is used universally: loudspeaker resonance and damping. Both the efficiency and impedance of a loudspeaker increase greatly at frequencies near its resonance. When driven by a constant voltage, the increased impedance causes a reduction of the current in the voice coil, so the system is approximately self-compensating. However, if the current is kept constant, there would be an enormously loud audio response peak at and near system resonance, because of the dual effect of higher efficiency and the increased power a current-drive system will deliver into the higher impedance near resonance. Because a loudspeaker system is basically a mass and a spring, once set in motion it will continue to oscillate on its own, unless there is some damping mechanism to absorb that kinetic energy. Some of that damping is done by the air pressure load, design of the cone suspension, and the stuffing inside the enclosure. But much of the damping is electrical. When the coil moves, it acts as a generator. Because a modern voltage-drive amplifier has a very low source impedance, it acts as a short circuit load on the voice coil and quickly suppresses the unwanted motion. This describes the present conventional wisdom. The author of this book does address those issues. He proposes greatly reducing the Q of the mechanical resonance, plus electronic equalization to compensate for any remaining resonance peak. He claims that electrical damping by a voltage-drive amplifier is ineffective at frequencies other than resonance and that reduction of the mechanical Q provides sufficient damping. This implies that loudspeakers designed for voltage drive won’t necessarily work with current drive and that the required electrical equalization must be carefully matched to the speaker(s). That can become quite complicated with multi-driver speaker systems and is a strong incentive to include equalization in the built-in power amplifier or crossover network. In other words, implementation of these ideas requires a system approach, as can be done effectively with powered loudspeaker products. The subjects mentioned here are those that immediately hit an informed reader “between the eyes.” This 342-page book contains a lot more! Figure 1: Aura, voltage drive. Figure 2: Aura, current drive. Figure 3: SEAS, voltage drive. Figure 4: SEAS, current drive. Figure 5: KLH woofer, voltage drive. Figure 6: KLH woofer, current drive. In the preface the author makes claims that remind me of typical Audio advertising fluff. In chapter one, he compares great electrical battles, such as between Edison and Tesla, AM versus FM radio, and so on. After reading that, I was anxious to get into the meat of his case. But not so fast… Chapter two is an extensive math lesson dealing with Second Order Systems. In the back of the book, appendices A through E are tutorials dealing with Complex Numbers, Linear Systems, Frequency Content of Signals, and Differential Equations. Appendices F through H are patterns for PCB copper. In chapters 10, 12, and 13 he presents designs for an amplifier and special measurement devices. Chapter 11 discusses Loudspeaker Implementations. So, buried amid all the math are some practical “how to” instructions. But the chapters that fascinated me the most are #3, Operation of the Electro-magnetic Transducer, and #7, Modeling & Simulation (of loudspeakers). Those are great analyses of the deep-down fundamentals of loudspeaker operation in which he reveals all manner of problems and reasons loudspeakers don’t work very well. Some relate to drive considerations, some are more general in nature. Those chapters enticed me into running experiments to investigate certain phenomena. Most of his objections to voltage drive stem from the back-EMF (Electro-Motive Force is another way of saying voltage) that is the result of the motion of the voice coil in its magnetic field. (Remember when you studied electric motors?) With a low impedance (voltage) source, that EMF causes reverse currents to flow in the voice coil. In an ideal case, those currents would be exactly out of phase with the driving current, would be part of the resistive component of the speaker’s motional impedance, and would do no harm. However, the motion of the cone and therefore the back-EMF is usually phase shifted from the drive, may be nonlinear, and may also be due to extraneous forces on the cone, such as pressure waves reflected from the rear enclosure. To get started I modified the left channel of an old Onkyo 40W stereo receiver to achieve current drive. I sampled the output current through a 0.56Ω resistor in series with the speaker load and used that as the source of negative feedback, instead of the output voltage. I adjusted the amount of current feedback so that both channels delivered the same power into a 10Ω load, from the same input signal. That enabled me to do monaural A-B comparisons with a DPDT switch. 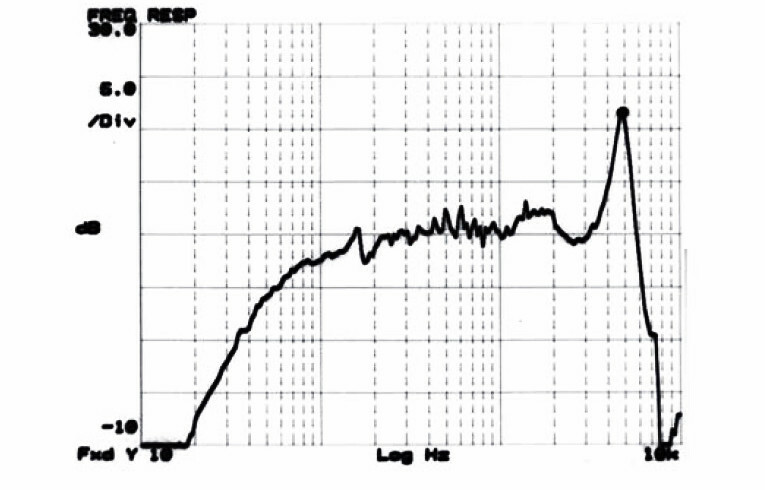 Initially the amp took off at about 1.5MHz and would ring with an inductive load, when hit with a fast pulse. Fixing that required routine engineering, and, when done, I verified that both amplifiers had the same clean transients and very flat frequency response over the audio spectrum. The source impedance of the voltage amplifier is about 0.33Ω. The current source impedance is about 1150Ω. There are a few effects you notice right away when using a current amplifier. One is that the output voltage skyrockets when the load impedance increases (as with speaker resonance) and it is very easy to run it into clipping. When the output voltage is clipping, there is no control of the current. So you must continuously monitor voltage clipping. With a partially inductive load, the rise and fall time of current pulses and the subsequent audio response are much steeper with current drive. That steeper rise is driven by voltage spikes. So, once again, considerable headroom is needed with regard to the voltage capability of the amplifier. Understand that the current in the load always comes about because the amplifier delivers a voltage. What we call current drive is, in reality, a voltage source in which the voltage is automatically and instantaneously adjusted up or down, to maintain the desired current. 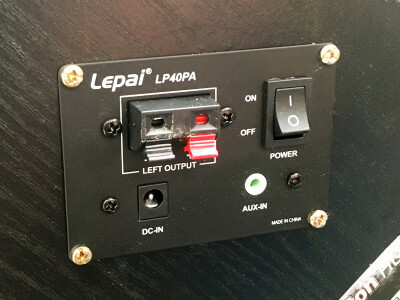 You should not operate a current amp with the load disconnected. The output voltage rises with an incredible gain and hits the ± rails very hard. That can damage the output transistors. Similarly, you can damage a voltage amp by running it into a short circuit. Also realize that while a voltage amplifier will deliver higher power into a low impedance load, a current amplifier delivers higher power into a high impedance load. 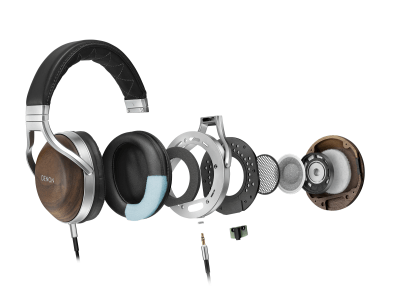 With current drive, a 4Ω speaker receives less power than an 8Ω speaker. That may seem counterintuitive because you are so accustomed to dealing with voltage sources, be they amplifiers or household electricity. 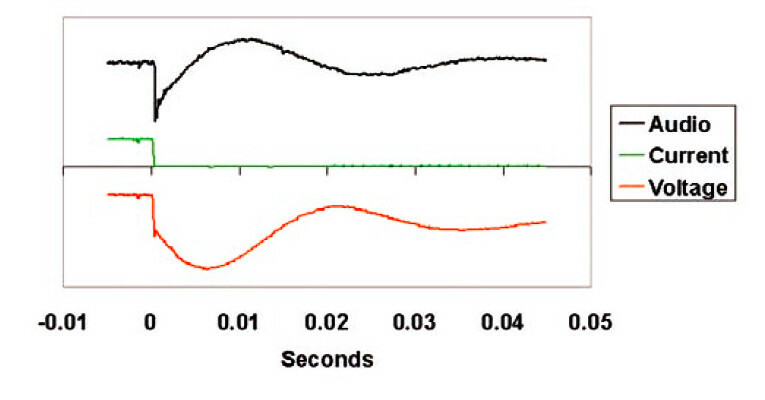 Remember that power = I2*R.
Figure 8: SEAS pulse responses. Using the modified amplifier, I ran several tests on three different speakers to see how they reacted to voltage or current drive stimulus. The speakers were an old KLH (Model 17) bookshelf system, a SEAS 5.5″ woofer (W15CY-001-E0015) in a sealed enclosure, and an Aura 3″ (NS3-193-8A) wide range transducer also in a sealed box. In the case of the KLH, the mike was in front of the woofer, so ignore the high end of those curves. I made no attempt to modify or equalize the speakers. 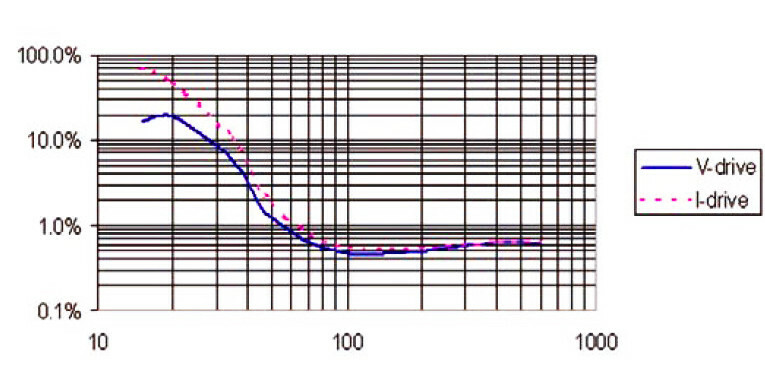 The first test compared frequency response with voltage and current drive. As expected, current drive made the deep bass louder and the treble more crisp. The increased bass was generally pleasant (people do love boosted bass!). The crisper highs were a mixed bag, depending on the source material. A complete design would include damping and equalization to render both ends of the spectrum to be flat. 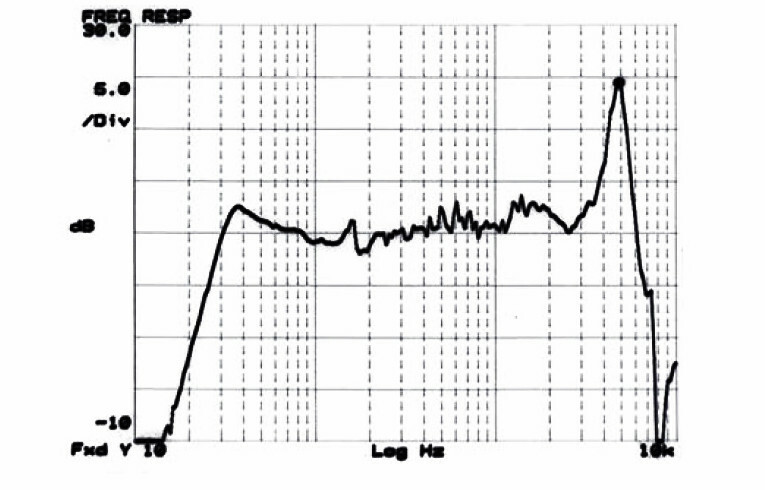 The six swept-sine response measurements are shown in Figs. 1-6. As you can see, the different speakers responded to the change in different ways. In two of the cases there was a significant benefit at the low end. But the Aura is clearly designed to behave well with voltage drive and doesn’t like current drive at all. 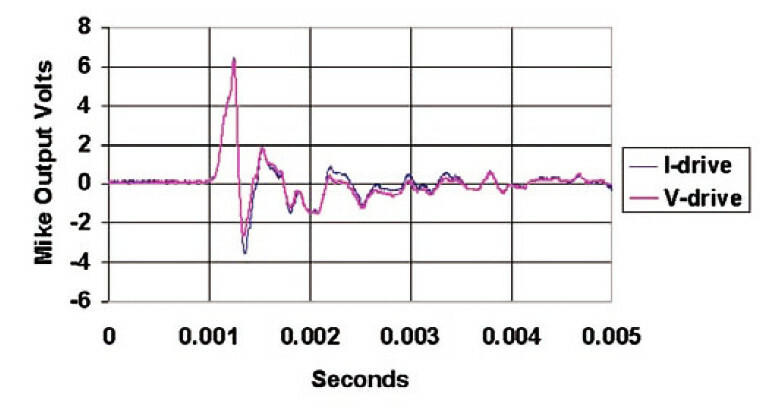 The next test was to hit those speakers with a 600ms pulse and look at how their acoustic responses are damped. That pulse is long enough to get the entire cone structure moving, but not long enough to interfere with the subsequent response (Figs. 7-9). Bear in mind that when hit with a transient, the cone will continue to vibrate (as does a drum). That, of course, is a distortion that can cause a “muddy” sound. So the quicker that movement is damped, the better. Here you see that with the KLH and SEAS drivers there isn’t much difference between voltage and current drive damping. For the Aura, however, the voltage-drive amplifier damps it significantly quicker and very effectively. 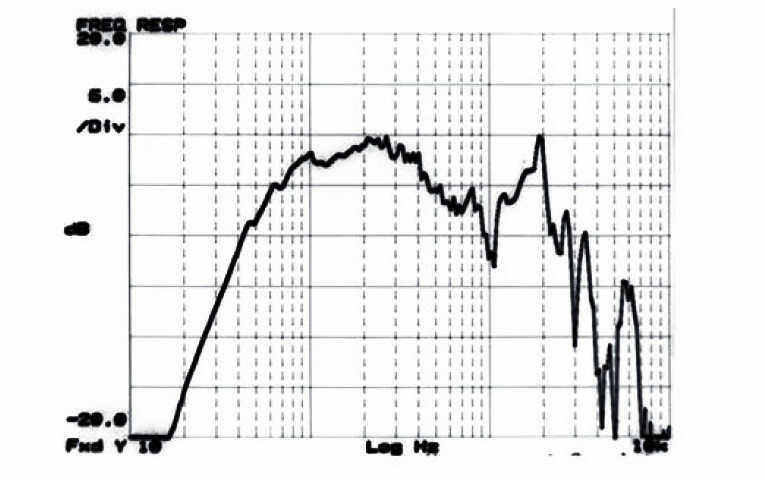 The frequency response data as well as impedance measurements (not shown here) indicate that the Aura has a much higher Q than the other two speakers. This tends to support the author’s claim that controlling the mechanical damping factor is effective, and, if done properly, electrical damping may not be necessary. For me, this was a very revealing exercise, but just one aspect of overall performance. To illustrate the existence of the back-EMF and resulting currents, I connected the terminals of the SEAS woofer to a well-regulated DC supply and then broke the connection, while my oscilloscope and B&K measurement mike “watched” what happened during the make and break. Each of the charts in Figs. 10 and 11, reading from the top down, shows the audio response, the current, and the voltage. Figure 10: SEAS DC power on. Figure 11: SEAS power off. 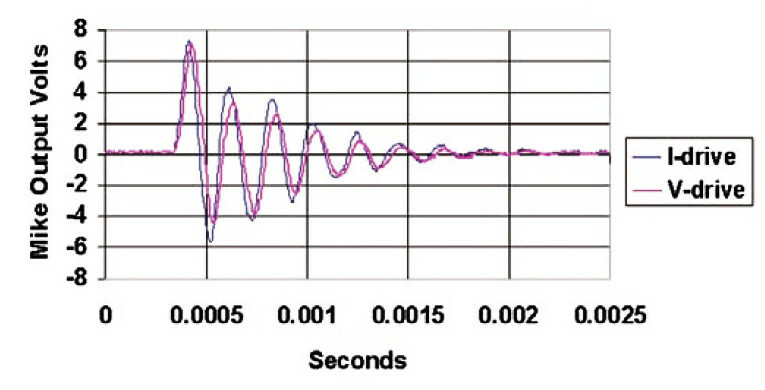 Notice that when the very low-impedance power source is applied, there is an immediate audio response, but subsequent cone movement is critically damped. While that is happening, the cone motion produces a back-EMF and the “reverse-current,” which reduces the net input current (just as in an electric motor). The “reverse current” does the damping. The externally applied and well-regulated terminal voltage is immovable. This illustrates a voltage drive situation. When the power source is disconnected, the voice coil is now looking into an open circuit. There is an immediate audio response as the cone returns to center, but then it continues to move as indicated by the audio ringing that follows. Note that the EMF caused by the cone motion appears at the speaker terminals. Because that is now an open circuit, there is no current and no power transfer; therefore, no electrical damping. 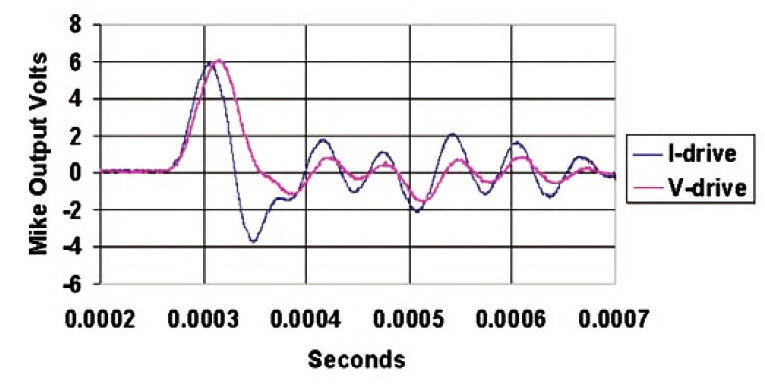 Note also that the acoustic output and back-EMF are not exactly out-of-phase. That is in part because the back-EMF represents the velocity of the voice coil and not its position. Also, the interaction between the cone and air is not a simple matter, as the author attempts to explain in chapter 3, pages 41 and 42. Air, too, has mass and elasticity. 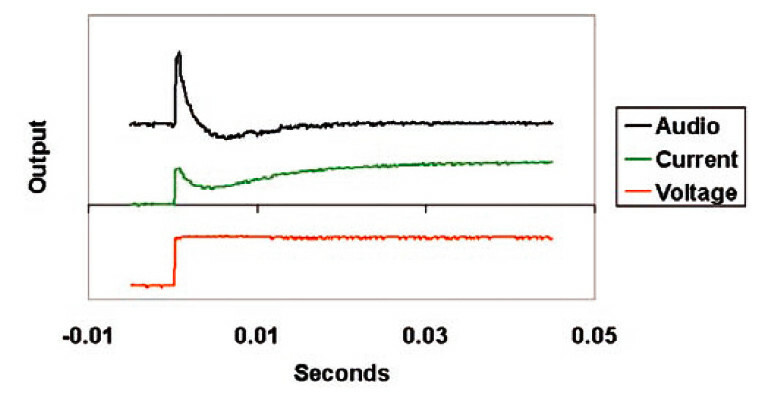 The “Power ON” response is similar to the behavior of the earlier pulse experiment. 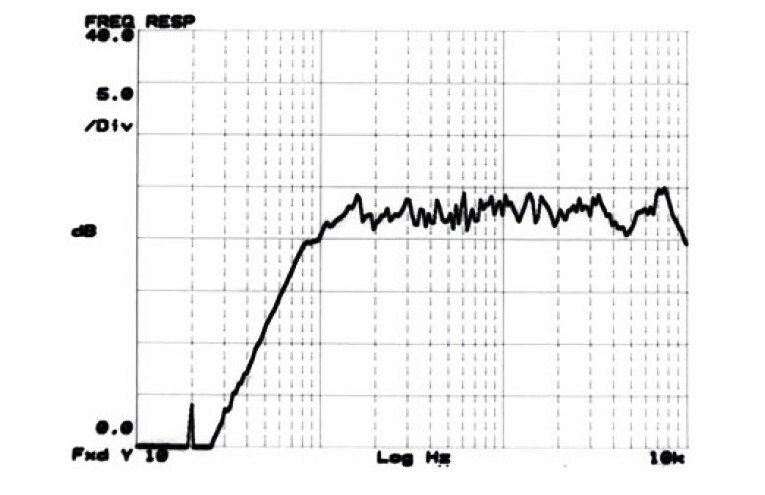 Even with current drive, you don’t see the large “Power OFF” oscillation when the pulse is over, in part because the amplifier is still connected. Even the current-drive amp has a finite source impedance and does some damping. Figure 12: SEAS phase data. I must emphasize that this DC experiment is a “science demonstration” and will not occur in normal use. Now, if you think that current drive (or voltage drive) will provide an iron grip on the cone movement, think again. The current provides the force. But the cone reacts to that force with a mind of its own. The author takes you through models of that behavior in great detail, involving electrical resistance and inductance of the voice coil, the motional impedance of mass, elasticity, and damping, and the interaction with air. 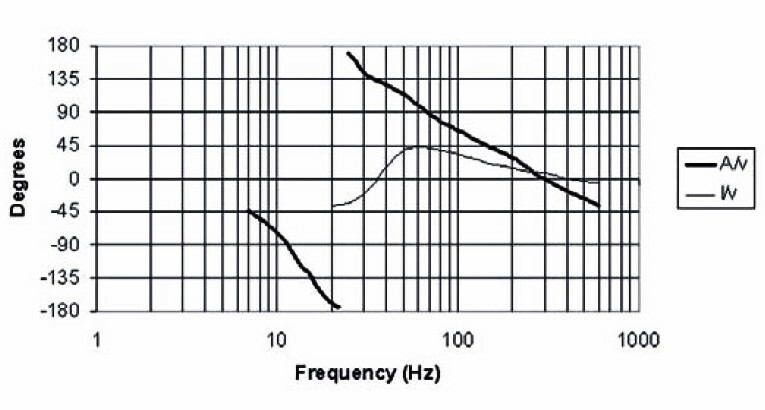 The effect of all that is revealed when you look at the phase relationship of acoustic output versus input voltage or current, over the frequency range of a speaker (Fig. 12). These are measurements made on the 5.5″ SEAS woofer. 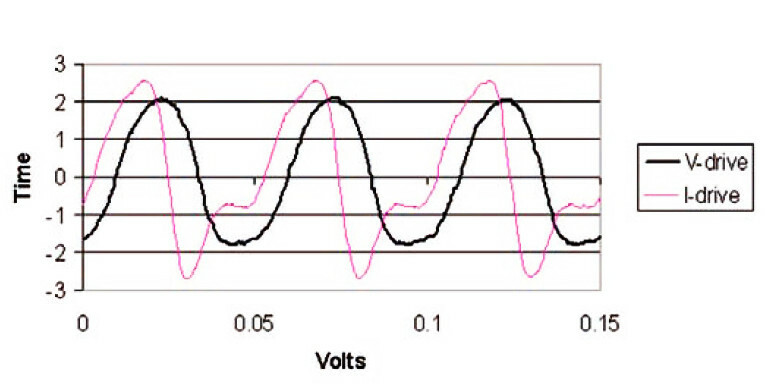 The thick lines represent the acoustic output and the thin one is the electrical phase of input current. In both cases, the phase reference is the voltage. At resonance (about 36Hz) the voltage and current are in-phase, as would be expected with a parallel tuned circuit. But the acoustic output in that region is nearly 180° out-of-phase, becomes exactly out-of-phase below resonance, and drifts back in-phase as the frequency decreases or increases. This illustrates the point that neither the voltage nor current is directly controlling diaphragm motion and air handling. All of this may or may not be interesting, but the reason for this journey is to attempt to reduce distortion. So, using low power (less than 0.2W) that stressed neither the amplifier nor speaker, I measured acoustic distortion over the useful range of the SEAS woofer. The result is shown in Fig. 13. The heavy line is with voltage drive and the dotted line is with current drive. You can see that distortion is quite low at the mid-range, with no significant difference between voltage and current drive. But it increases rapidly as frequency drops and cone excursion increases. Bear in mind that below resonance it is virtually impossible to get a really clean acoustic sine wave. Nonetheless, in that region, voltage drive seems to exert better control of the cone. The plot in Fig. 14 shows the SEAS acoustic waveforms at 20Hz. It is interesting that when I took this data, the distortion of the input current was 0.5% with current drive and about 9.6% with voltage drive. It seems that the reverse current generated by spurious cone movement “distorted” the voltage drive net current in such a way as to correct some of the distortion. 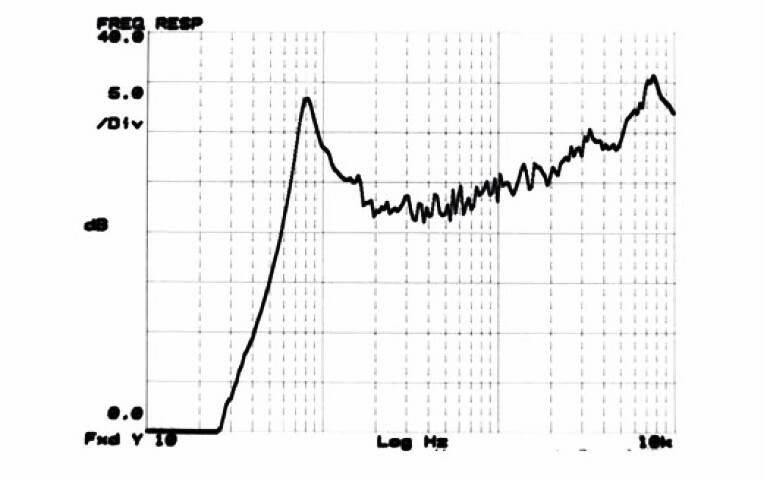 I performed a similar acoustic distortion measurement of the KLH system at 18Hz, at the same power level. The distortion was 12% with voltage drive and 19% with cur-rent drive. I have been in e-mail contact with the author and shared this finding for his comment. He was not surprised and pointed out that the harmonics of very low frequency signals can fall in the range near mechanical resonance and would naturally be exaggerated. He believes that reduction of the Q would help and also made the point that this may be a moot issue because there is very little sound content to be found at those low frequencies. 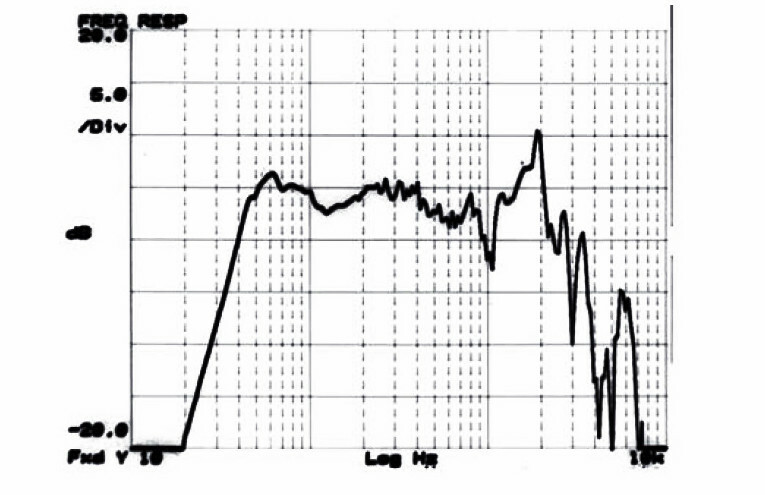 In these tests, the KLH, which has the lower Q, had less distortion than the SEAS. I’ve also watched the real-time spectrum of music on the FM band and have not seen anything below about 30Hz. This investigation has been limited in scope because I could not modify the loudspeakers. I compare this to a weight-loss plan. To achieve the results, you must do the whole program. Therefore, I am going to resist the temptation to draw any summary conclusions. Let the reader decide. The book’s author points out many problems associated with voltage drive, and my data has pointed to some problems with current drive. 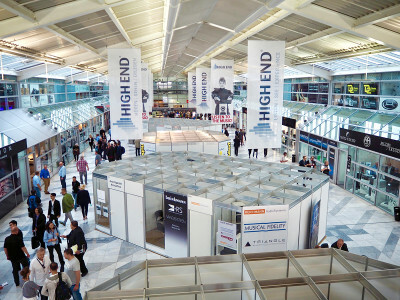 But today’s powerful computer modeling and systems approaches, as well as intense competitive pressure for product differentiation, could yield some high-end systems based on current drive. I would like to see that happen! This article was originally published in Voice Coil, July 2010.